All 3D video games have virtual cameras which follow the action, including the Super Smash Bros. series. During a match, the camera zooms to show all characters - on large stages such as Temple, 75m and New Pork City, this can cause the camera to zoom out excessively. 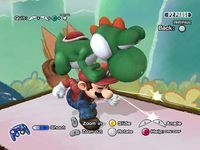 Special Melee and Brawl modes exist with slightly altered camera physics, allowing the camera to be locked in place or tilted at an angle. In addition, Ultimate features a special camera configuration which appears in the stages Training, 75m and Balloon Fight, which always faces the screen head-on in normal gameplay, and removes all parallax, while still technically rendering models and hitboxes in 3D. As such, viewing the stage in camera controls can result in very unusual perspectives, particularly when panning the camera while it is at an angle. In the single player modes, it's possible to zoom by tilting the C-Stick. Camera Mode is a special vs. mode in which still pictures can be taken during an endless match with unlimited lives using the Smash Cam. The pictures can be of fighters, items, backgrounds, or any combination. As long as it is on the screen, photographs can be recorded. Each photo takes up some data on the memory card. Player 4 controls the camera. Players 1 through 3 can be either computer controlled or human controlled, while Player 4's controller is used to control the camera. Anyone can pause and quit, but only Player 4's pause can be used to take pictures. Items can be set to any normal battle settings, with set variations on choices and frequency of appearance. Stages are chosen as normal, save that there is no time limit. The joystick is used to move the camera around and pressing L or R cycles through close-ups of the three fighters, centering the camera on them and following their movements. The C-stick pivots the camera around a central pivoting point. If L or R was used to select a character to follow, the pivoting point is on the selected fighter. Zooming is done by pressing X or Y button and dollying is controlled by the D-pad. The actual "shutter" is the Z button. This can be used with or without pausing. If pausing first, Player 4 can use L and R to choose a fighter, then pivot, zoom in and out, and dolly around until the desired scene is achieved. After the picture it taken, there is the option of saving it or discarding it. Photos taken are saved onto the memory card. If a memory card is in slot B, it will be saved there. Otherwise, it will be saved onto Slot A's card. Photos range from around 4 to 12 "blocks" of memory, increments used for GameCube memory cards. The average photo takes up around 7 or 8 blocks. Controlling the camera while pausing a Brawl in SSBB. In Super Smash Bros. Brawl, snapshots can be taken at any time from the pause screen, as opposed to only in Camera Mode in Melee. Camera Mode does not make an appearance in Brawl, as it has been rendered obsolete due to the ability to take pictures at any time. Snapshots can also be taken in the Subspace Emissary. Snapshots cannot be taken in stadium mode except in the Boss Battles Mode. However, when viewing replays, the camera can be more freely controlled, similar to camera mode from Melee, to focus in on characters rotate and, if the user's television set is at 4:3 aspect ratio, crop to widescreen. 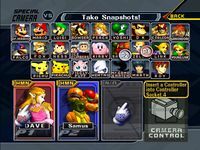 Snapshots can be saved onto SD cards, or onto the Wii itself, as opposed to the special GameCube memory cards for Melee. These snapshots can be sent to friends and shared. Snapshots make a return to both Super Smash Bros. for Nintendo 3DS and Super Smash Bros. for Wii U. In Super Smash Bros. for Nintendo 3DS, players can take snapshots in 3D or 2D; while this is a small change, it is noticeable, as the 3D makes the characters, stages, or items appear closer to the camera on a 3D image. While players can take snapshots in Smash Run, they cannot move the camera in any way except for zooming in and out. Snapshots are saved to the 3DS's SD card. In Super Smash Bros. for Wii U, there exists a new mode for snapshots, known as Paint. Players are given the option to paint anything they want on snapshots they've taken in-game. Snapshots taken in-game have to be saved to an SD card, as opposed to the system itself. The camera being controlled in Super Smash Bros. for Wii U. The paint feature in SSB4. The camera being controlled in Super Smash Bros. for Nintendo 3DS. In Ultimate, the Pause screen has been updated to contain a list of options that can be selected, one of which is for camera controls. Camera controls and snapshots return, with several additions. All of the pause camera's previous functionality returns - zoom, pan, and rotation - and has generally less restrictive limits across stages than in previous games, allowing greater freedom of camera movement around the stage. New camera control options have also been added: the camera can now be tilted left or right (rotating it about the Z axis), and can have its field of view (referred to in-game as "angle") increased or decreased. While in camera controls, the player can now apply one of sixteen filters (e.g Two-Tone, which only features solid black and white), one of twenty frames (e.g. black game logo on the bottom right corner), and hide certain visual effects. Additionally, there is a "frame-by-frame" mode, allowing the player to advance the game forward by one frame (or more by holding the button) while still controlling the camera. Snapshots can be taken by pressing the selection button or with the Nintendo Switch's native snapshot function. In either case, they are saved to the console's internal storage, and from there can be saved to a microSD card if one is inserted. Unlike in previous games, the camera option is disabled during a Final Smash, and when certain Assist Trophies are present. The camera could be zoomed in to the point of bypassing the back-face culling on each character's model, leading to humorous results. The camera controls within a replay. Notice the slightly different UI from the one in a match. A snapshot taken with a filter and with notable camera adjustments. This page was last edited on April 11, 2019, at 14:49.